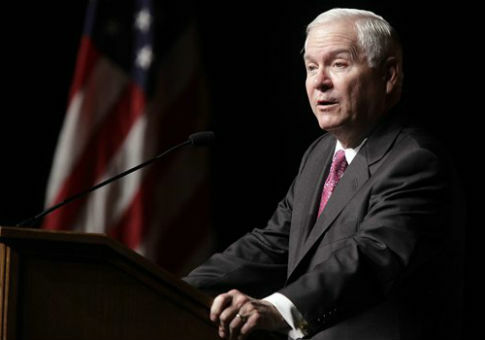 Former Defense Secretary Robert Gates said the next president has to "lay down a line" with Russian President Vladimir Putin amid increased aggression from Moscow. "The notion that we just continue to let the relationship deteriorate, or that we tolerate whatever Putin wants to do, I think both of those are unacceptable alternatives," Gates told CBS News in an interview published Sunday. "The new [American] president has to have it as a priority in terms of seeing if he or she can move this relationship to a different place." Gates pointed to several incidents of Russian military jets flying dangerously close to U.S. warships and aircraft in recent months, heightening tensions between old Cold War enemies. He warned that Moscow’s dangerous behavior could lead to an accident that would spark U.S. military action. "That for me is one of those areas where the new president has to lay down a line: ‘You don’t do that with our ships or our planes anymore,’" he said. "It must begin with letting Putin know he’s come to the end of the rope, that we are not going to put up with his meddling, and there will be further consequences." Gates, alluding to President Obama’s Russian policy, said the next White House occupant must take a "tougher" approach toward Russia. He also appeared to give an implicit criticism of Obama’s policy in Syria, noting how the U.S. had kept Moscow out of the Middle East since the 1970s, with "no real influence or presence there ever since," until today. "Now it’s pretty clear that any negotiation on Syria, if there ever is one, Russia will be at the table," Gates said. Hillary Clinton has called Putin a "bully" and threatened to implement tougher financial sanctions against Russia if the country continues to intervene in Ukraine and Syria should she win the White House in November. Donald Trump has taken a different approach on the campaign trail, praising Putin as a "strong" world leader who he would "get along very well with" after the Russian president called the Republican nominee "bright and talented." Gates said Americans need to elect a president who will detail explicit guidelines for the Russians in terms of what the U.S. is willing to tolerate, making clear to Putin that the U.S. will not be pushed around. This entry was posted in National Security and tagged Donald Trump, Hillary Clinton, Robert Gates, Russia, Vladimir Putin. Bookmark the permalink.